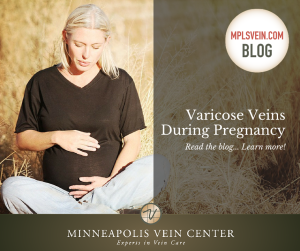 Varicose veins while pregnant are common. The bulging, bluish veins can be unpleasant to look at and may also cause some uncomfortable symptoms like swelling and heaviness. Varicose veins during pregnancy are caused by some of the many pregnancy-related changes in the body. A pregnant woman has 30-50% more blood in her body, which increases the burden on veins, which pump blood back toward the heart. Additional pressure is put in the pelvic blood vessels because of the expanding uterus. Increased levels of progesterone, a hormone that helps to support pregnancy, causes blood vessel walls to relax. Stretch – Avoid sitting or standing for long periods of time, which can make swelling or achiness worse. If possible, try to stretch your legs by flexing and pointing your toes several times each hour. Compression Stockings – Compression stockings support the leg and promote better blood flow. It’s best to put them on first thing in the morning when legs tend to be less swollen. Exercise – Regular low-impact exercise like walking helps to keep blood flowing in the legs. If you’re healthy enough for exercise, it may help prevent varicose veins from getting worse while keeping you fit throughout your pregnancy. Wear Comfortable Shoes – Sneakers and other supportive shoes are best for people who suffer from varicose veins. High heels alter the walking motion and may contribute to worsening of varicose vein symptoms. Many cases of varicose veins during pregnancy clear up on their own within a few weeks after birth. Unfortunately, some varicose veins stick around long after pregnancy. If your varicose veins haven’t gone away, consider making an appointment with the interventional radiology experts at Minneapolis Vein Center. During your initial vein consultation, you’ll learn more about your specific condition and which treatments may be best for you. Our team can also help you understand insurance requirements and answer any additional questions you may have.